Age 81 of Oakley passed away on Thursday, October 18, 2018 at her home. A Funeral service will be held at 5:00pm on Tuesday, October 23, 2018 at Nelson-House Funeral Homes Martin Chapel with Pastor John Miller officiating. The family will receive friends that day from 1:00pm until the service. Patricia was born on August 15, 1937 to Victor and Lucille (Mendyk) Adamski in Saginaw. She married Carl W. VanHorn on January 19, 1956; they celebrated 54 years of marriage before he predeceased her in 2010. Patricia worked for Olin Kraft in Owosso for many years. 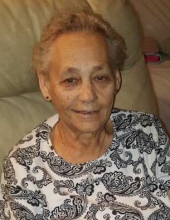 During her life, she was a member of the American Legion Auxiliary and Oakley Community Church. She loved flowers, enjoyed playing bingo, and loved being with her family. Patricia is survived by her children, Randy (Helen) VanHorn, Mike (Tammy) VanHorn, Carlene (Craig) Lawson, and Vicki (Eric) Peaster; her 14 grandchildren and 11 great-grandchildren; her brother, Daniel Adamski; her brothers-in-law, Dale Lister and Ralph VanHorn; and many nieces and nephews. She is predeceased by her husband, Carl; her son, James (Suzanne) VanHorn Sr.; her granddaughter, Andressa; her sister, Marion Lister; and her sisters-in-law, MaryAnn (Don) Roberts and Barb (Jack) Ockerman. To send flowers or a remembrance gift to the family of Patricia Ann VanHorn, please visit our Tribute Store. "Email Address" would like to share the life celebration of Patricia Ann VanHorn. Click on the "link" to go to share a favorite memory or leave a condolence message for the family.